Click on one of the questions on this page to view more details about DroneFinder and how it works. If you need further support, please get in touch. DroneFinder is an online service designed to assist in getting your aircraft returned to you if they ever get lost due to a fly-away, signal-loss, a crash or other event that results in it not coming home while flying. DroneFinder is for both commercial and hobbyist "drone" and "FPV" pilots who fly radio-controlled aircraft and wish to help protect themselves from sigificant financial loss if their aircraft does not return home after a flight. 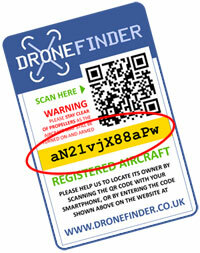 DroneFinder gives each aircraft you register a unique code on a sticker which can be scanned using a smartphone - the resulting match will allow anyone who finds your aircraft the ability to view your contact information and send a text message or e-mail with the exact location of your aircraft so that you can retrieve it. How does DroneFinder help retrieve my aircraft? Without a DroneFinder sticker onboard your aircraft, options for retrieving a lost model are extremely limited. More often than not it will be found by a member of the public who, in the absense of any contact information being available, will find themselves in the position of some expensive kit - which more often than not ends up on an auction site such as eBay or Gumtree. Even taking the equipment to the police doesn't help because not even the police have any clue who the equipment belongs to. DroneFinder is a subscription-based service - you can either choose to pay a low monthly fee of £1.99, or pay for a year in advance with a 15% discount! A plan is also available for people with larger amounts of aircraft for under £50 per annum. Please see the pricing page for more details. Couldn't I just put my phone number on my aircraft? Traditionally this is what people used to do with their models but there are a number of disadvantages. You can update your aircraft information on the website - any time your number changes, all of your aircraft are immediately up to date. You can hide your address / telephone number from any finders, whilst still allowing them to contact you through the website - the system will send you an SMS message without revealing your phone number to whoever finds your aircraft. The smartphone can, at the time of finding, retrieve precise geographic coordinates of the position of your finder - therefore enabling quick retrieval using a satellite navigation system or equivalent. DroneFinder will display safety information to the finder warning them that your aircraft may still be armed, preventing potential serious injury which you could be liable for (for instance if the motors spool up). Am I tied to a contract or a minimum period? No, there is no contract involved - you can stop your subscription at any time simply by cancelling the recurring payment from within your PayPal account. Please note that if you cancel a subscription, any products you have previously purchased will no longer work until you restart the subscription. Where can I buy products for aircraft on my account? Once you have an active subscription, you can purchase identification stickers from our shop for each of the aircraft on your account so that once they're scanned, your contact details and other information will be available to the finder. Please visit the online shop to view our range of products. How many aircraft can I add to my account? If you have a personal plan, you can add up to 10 aircraft to your account - Users with a higher-tier subscription can add unlimited aircraft. They'll each be given a unique code, and products can be purchased for each aircraft when required. Does it cost extra to add more aircraft to my account? You can add up to 10 aircraft onto your personal plan, each with their own identification products that you can purchase from our online shop. If you need more than 10 aircraft, you will need to upgrade to the next tier which allows you to manage unlimited aircraft. How does the subscription service work? Subscription payments are handled by PayPal - we don't store your credit card information. You select which period you'd like to be billed (monthly or yearly) and your account will be updated accordingly once you have made a secure payment on the PayPal screens. You will then be billed continuously either monthly or yearly (depending on the period you specified) until such a time that you cancel your subscription. How can I cancel a subscription if I change my mind? Subscription payments are handled by PayPal - to cancel your subscription, log into PayPal and visit the "Recurring Payments" section of your account. Once there you can cancel your DroneFinder subscription. Can I get a refund if I don't like this service? If you are on a monthly payment subscription we cannot refund your current month. Simply cancel your recurring payment from within PayPal, and you will not be billed again once your current subscription period runs out. If you are on a yearly or business subscription and decide to cancel, your refund will be processed from the last day of the month that you request your refund. Do people understand how to scan QR codes? QR codes have been around for quite a while now and while functionality is available on most smartphones for scanning them, it is true that some people do not know how to do it. However, every product we sell also includes a unique alpha-numeric code that can be entered directly into the website which performs the exact same function as scanning the code, alleviating the issue entirely.